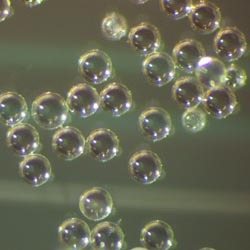 Polystyrene Spheres and Microspheres are highly spherical plastic particles in sizes between 10um and 7mm. Polystyrene spheres with density slightly greater than 1g/cc are a useful tool as reference particles in simulation experiments and process troubleshooting. These particles make excellent precision fillers and template of choice for biological applications. 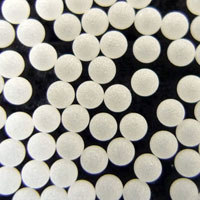 The spheres are offered as a dry powder with no surface functionalization or coatings. They are is inert, chemically stable, and safe for handling. The primary safety precaution is minimizing inhalation of dust for particles less than 10 micron in diameter.